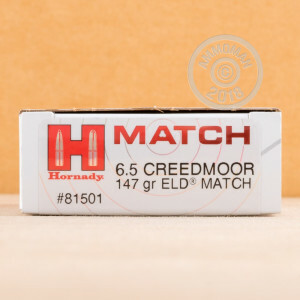 This 6.5 Creedmoor round has been prepared by Hornady to deliver unparalleled match accuracy, as necessary for serious competition as it is for satisfying target practice. Each of these 20 cartridges’ components have been carefully selected for their uniformity, and precisely loaded so that you can count on identical performance with each and every shot. 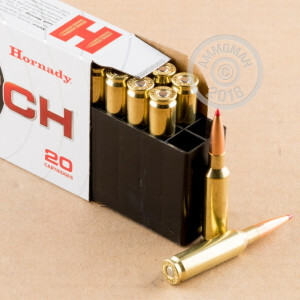 Their brass casings are sturdy to the point where they may be reloaded multiple times, turning these mere 20 cartridges into a potential 100. This round’s bullet deserves the spotlight, of course. 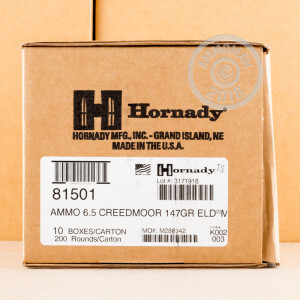 The 147 grain ELD Match features a Heat Shield tip, a rugged polymer spike which is immune to the effects of air friction so that heat can not warp it perfect symmetry. The ELD Match’s stellar ballistic coefficient is further optimized by its boat tail design, nearly perfectly concentric AMP jacket, and secant ogive profile. The result is a bullet that will slice through the air on an unerring course toward its target.